The North Coast 500 (NC500) tourist route, launched in 2015, has had a positive impact on both visitor numbers and business trade. This is according to a new report commissioned by Highlands and Islands Enterprise (HIE). Referred to as Scotland's answer to Route 66, the 516-mile NC500 was created by the North Highland Initiative (NHI). 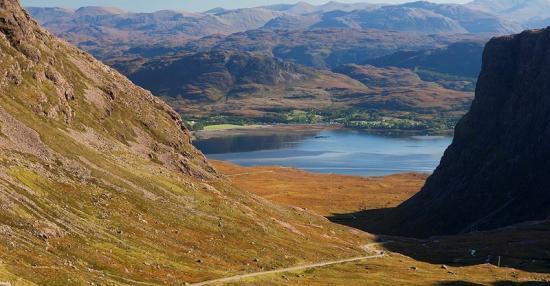 Its aim was to boost tourism in the north Highlands and generate economic opportunities for the area. The study, carried out by the University of Glasgow Training and Employment Research Unit, estimates the route has attracted 29,000 additional visitors and £9 million additional spend in its first year. The research drew upon various data, including figures from tourism information centres along the NC500 which showed an average 26% increase in visitor numbers since the route opened. This compares with a 6% average increase across Highland. Traffic data also reveals that volumes along the route were up by some 10%. The study included interviews with accommodation providers and visitor attractions along the route, which identified an average 15% - 20% increase in trade. Other factors would have contributed to this growth, including the fact that it was a generally strong year for tourism in Scotland and the Highlands. However, the findings from the study, coupled with the results from a previous survey of businesses on the route by NHI, indicate that the NC500 has been a major driver of recent increases. The report also highlighted challenges to ensure long term success of the NC500. These include maintaining the condition of the route, ensuring sufficient parking, waste facilities and public toilets, and continued efforts to encourage better driving. It also highlighted challenges in meeting the increased demand for labour, with earlier reports suggesting the route could create upwards of 200 jobs. Tourism Secretary Fiona Hyslop said:"The Scottish Government is strongly supportive of innovative projects, particularly those driven by industry, to encourage economic growth, and I welcome the very positive impact the North Coast 500 has had on the tourism economy in the Highlands. "Today's report shows the route is already delivering for the north of Scotland and has tremendous potential to further benefit the communities it serves, encourage more investment in tourism facilities, stimulate jobs and expand the tourism season. I look forward to continuing to work with HIE and other partners to strengthen the growth we're seeing as a result of the NC500’s introduction." David Oxley, HIE’s director of business and sector development, said:"This study suggests the NC500 has very quickly had a positive impact in the north Highlands. “Through working collectively with businesses and communities along the route, North Highland Initiative have created a distinct and exciting tourism product. It’s a product that has helped promote some of Scotland’s most stunning scenery to a global audience, whilst also providing a further boost for the Highlands and Islands’ growing tourism sector. “With the NC500’s popularity set to be sustained over the coming years, it is crucial that we understand the impact it has on communities and businesses. This report provides a baseline to monitor this impact over time. “The long term sustainability and success of the NC500, and responding effectively to the challenges identified in the report, will require collaboration between public agencies, businesses and communities. We very much look forward to being part of that process." HIE has established a partnership including Police Scotland, transport Scotland, Scottish Natural Heritage, The Highland Council, Visit Scotland and other interests to ensure the route is developed in a sustainable way.